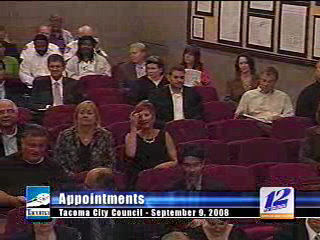 TV Tacoma All-Stars: Live from Tacoma it's Tuesday night! "Thank you for the proclamation... we're building the memorial wall, we even got a congressional medal of honor name signed up." 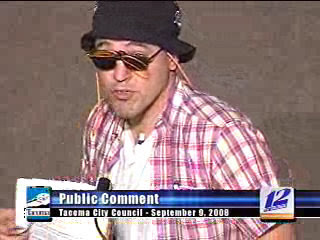 "we now move to public comment, Mr. Hill"
"Shalom. 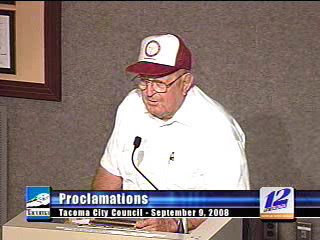 [mayor demands removal of telephone prop... hilarity ensues] Live from Tacoma it's Tuesday Night!" RR Commentary: Mr. Hill's oration was in top form tonight. 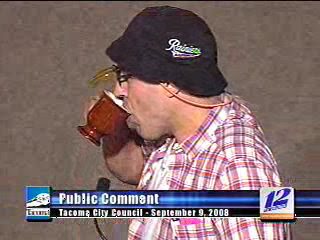 First instance of the coffee cup prop--always an effective hypnotic tool for subliminal messages. 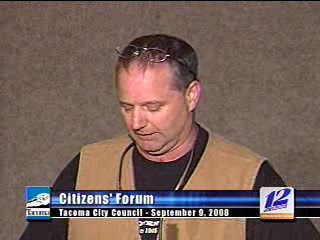 "The city continues to waste precious methane gas as it is vented and burned by the Tacoma solid waste facility. I submit to the record a CD burned with descriptions of methane-gas-engine-conversion methods for vehicles. 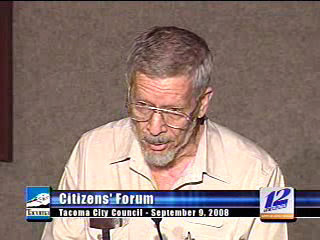 Boon Pickens a wealthy crackpot urges us to conserve energy. We are wasting this renewable energy source. 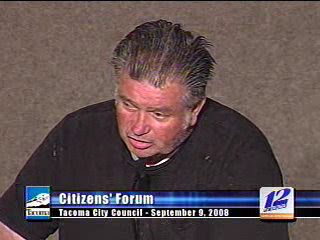 I demand the city council do something or I will do everything humanly possible to get our federal money taken away!" 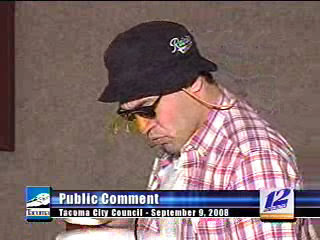 "Mr. Mayor, we've heard these comments many times before. 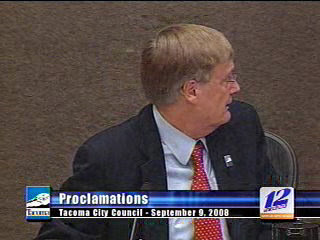 I would like to ask the city manager to send another memo about the methane gas and why we are not using it again? Thank you. 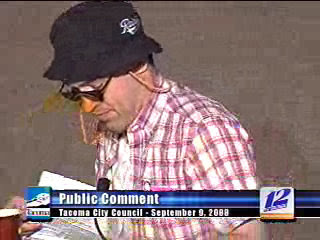 Also, I would like to add that nobody is calling the methane guy a crackpot." RR Commentary: You see, crackpots can get results! Take mental note my friends. 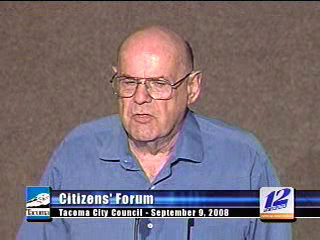 "A neighbor recently called the police to warn them I was being held hostage in my own home. I had fallen asleep in front of the Tee Vee. I would like to thank the TPD for their excellent response. One police man said he was sad there were no bad guys to assault. Thank you." 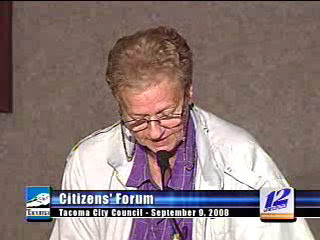 "Tacoma needs to do more to protect our historic single family residences. I suggest instead of a normal R1 zone we do a HR1 for historic homes." "When we let our sidewalks crumble to make it difficult for even able bodied men to travel, we are doing the same thing as putting a 'this race only' sign on a drinking fountain. We need to fix the sidewalks for all people... people in wheelchairs! elderly folks! it's a crime what you've allowed to happen!" "Good evening, I am Jessie Hill. I have nothing to do with that "Traveller" character that appeared earlier in the show... [dramatic pause] You see these patches? I have the MIA patch above the flag. This is not regulation. 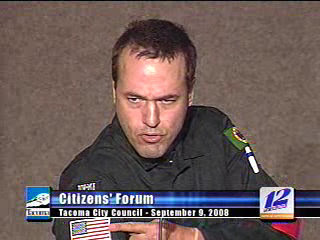 Also I am not affiliated with any armed service, Although I am a supporter of citizen law enforcement. [etc. etc. ] 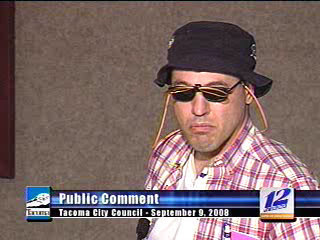 "
THE MAYOR: Mr. Hill aren't you running for Pierce County sheriff? HILL: I have no comment. HILL: Any answer I give would be in violation of the council meeting rules. "It's the politics that uses religion as a wedge and patriotism as a bludgeon, a politics that tells us that we have to think, act and even vote within the confines of the categories that supposedly define us, the assumption that young people are apathetic, the assumption that Republicans won't cross over, the assumption that the wealthy care nothing for the poor and that the poor don't vote, the assumption that African-Americans can't support the white candidate, whites can't support the African-American candidate, blacks and Latinos cannot come together." *RR Note: this is not actually what he said. by Erik on 9/9/2008 @ 8:56pm How the heck did Hill change his clothes? by NineInchNachos on 9/9/2008 @ 9:03pm Hill is a non-linear being. the Melon folks made it in the Tribune! by marumaruyopparai on 9/9/2008 @ 11:15pm The Traveller is back!!! Jessie Hill's appearence is a welcome one as well, that's a very patriotic still, thanks RR. by NineInchNachos on 9/10/2008 @ 9:36am No problem my friend. Vote "Hill" for Sheriff ! Interestingly, they are making the report on their "Lights and Sirens" blog which is basically a crime blog. by NineInchNachos on 9/10/2008 @ 10:45pm perhaps an indirect endorsement for sheriff? What say you Ian Demsky ? by izenmania on 9/11/2008 @ 2:07pm In support of the Methane Man: If San Antonio can do it, why can't we? 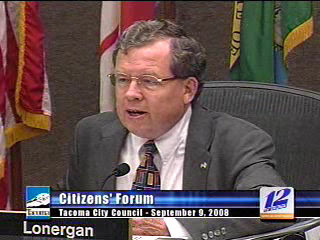 by NineInchNachos on 9/11/2008 @ 2:36pm Izenmania, the picture I get listening to the gas guy is that Tacoma received federal money to build the methane gas capturing facility... its now built and instead of using the gas it's burnt off with one of those 'eternal flame' type stacks... Lonergan asked the city manager for a report so we'll see what he says. The man really needs an 'urbanist' style blog! by izenmania on 9/11/2008 @ 2:43pm Yeah, I wasn't really sure what the whole deal was with him. I just saw that article and was reminded. by Erik on 9/11/2008 @ 3:03pm Yeah, I wasn't really sure what the whole deal was with him. I just saw that article and was reminded. He has some real moments of lucidity. The discussion of public commentators being "crackpots" or not was a good discussion point as well and addressed by Lonergan.